Of all of Kiribati, Fanning (otherwise known as Tabuaeran) Island, is the pick with almost year round consistent swell. Fanning has breaks on the North and South, making the most of both Northern Hemisphere and Southern Hemisphere swells. 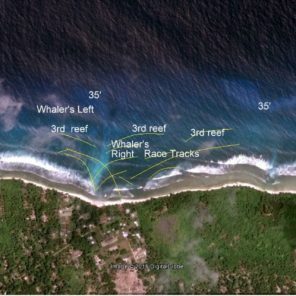 The two most consistent breaks are 'English Harbour' in the South with strong and consistent March to June; while 'Whalers Anchorage'' in the North has strong and consistent swell from October to March, and even picks up some southern swell. Proudly supported by Pacific Islands Trade & Invest, Australia.